Let’s be honest. 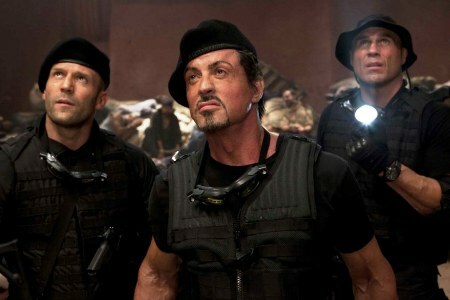 There are only three things you need to know about The Expendables to understand exactly what you’re in for: It’s co-written by Sylvester Stallone, it’s directed by Sylvester Stallone and it stars, you guessed it, Sylvester Stallone. We should also mention the ensemble supporting cast of once-great (and a couple still-great) action stars, unfortunately sans Jean-Claude Van Damme. You don’t go into a movie like this expecting to be wowed by the script or impressed by the acting chops of the cast. You go to watch a bunch of bad-asses blow things (and people) to smithereens. Don’t expect much more than that and you’ll be just fine. Our captain on this adventure is Barney Ross (Stallone), the tattooed, cigar-smoking leader of a motorcycle gang of over-the-hill mercenaries, who split their time between odd jobs rescuing hostages and reminiscing about the good old days. His trigger-and-knife-happy pals include some of the biggest names in testosterone-oozing entertainment: Jet Li (as martial arts master Yin Yang), Jason Statham (as blade expert Lee Christmas), professional wrestler Steve Austin (Paine), former NFL player Terry Crews (Hale Caesar), ultimate fighter Randy Couture (Toll Road) and returning after a 15-year hiatus from film, Dolph Lundgren (Gunner Jenson). Bruce Willis (Mr Church) and California Governor Arnold Schwarzenegger (Trench) make cameo appearances in a scene played up for laughs, including a jab at the latter wanting to become president. Mickey Rourke seems both well-cast and out of place amongst his hulking mates, clearly the only one able to squeeze out a few man-tears for an emotional monologue about his poor, black heart. A majority of The Expendables action begins when the team, minus the loose-cannon Jensen, is hired away to the island of Vilena to overthrow the corrupt General Garza (David Zayas) and a greedy rogue CIA agent (Eric Roberts). The general’s daughter Sandra (Giselle Itie) plays both a damsel in distress and a leader of a struggling resistance. Saving the island of Vilena equals saving the lost souls of this band of expendables, and they’re determined (and successful) at blowing everything away in their path to redemption. There are vague references to actual political controversies, including a graphic water-boarding scene and a well-developed view of America as an evil empire. The female characters in the film also leave much to be desired. A cheating girlfriend, a big-breasted floozy and a captive general’s daughter are about as wide-ranging as they come, which is not all that surprising given the film’s clear evocation of the high-body-count classics of the 1980s and 1990s, before most of these guys were expendable. Longtime fans of the Italian Stallion and his Rambo series will enjoy The Expendables for its overflowing testosterone and firefights that seem to grow exponentially larger as the film progresses. Nostalgia for the bygone era of bristling muscles and leading men who do their own stunts runs thick, and Stallone generously employs the same cheesy CGI gore used in his 2008 Rambo sequel to dismember and split bad guys in half to the crowd’s delight. For the rest of us, however, the recognizable faces and old-school ultra violence just aren’t enough to overshadow the incomprehensible motivations of the characters and the often-laughable dialogue.